Create unlimited number of Custom Registration Fields (Address & Personal Info) which will be propagated in all sections of your OpenCart website, Order Information and Order Confirmation Emails. You can set any kind of NEW Field like: VAT ID,.. Missing the Order Email sent to Store Owner? 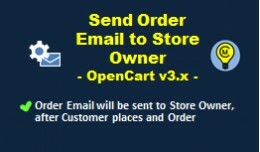 Now you can have the functionality in your OpenCart v3.x website with this extension. The Order Email sent to Store Owner will contain the same information as the Order Confirmation Email sent to Cust..
Retrieve to Excel all Customers Data including the Custom Fields and corresponding values. 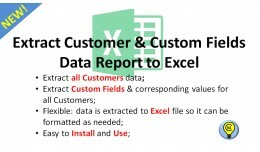 You will find the Custom Fields at the end of the Excel report (after customer_group field). Extract any Type of Custom Field: Text, Select, Radio, Checkb.. 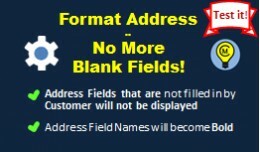 Format Address - No More Blank Fields will help you remove all blank fields from Address information, and will format the Address field names to Bold. Special Features: - Fields that are not filled in (blank) by the Customer will not be.. 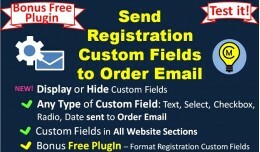 This is a Free mod created as an add-on for Send Registration Custom Fields to Order Email extension. NOTE! 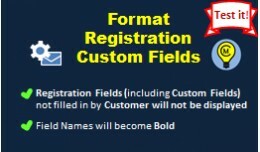 : It will work only if Send Registration Custom Fields to Order Email extension is already installed in the Admin. Special Features:..